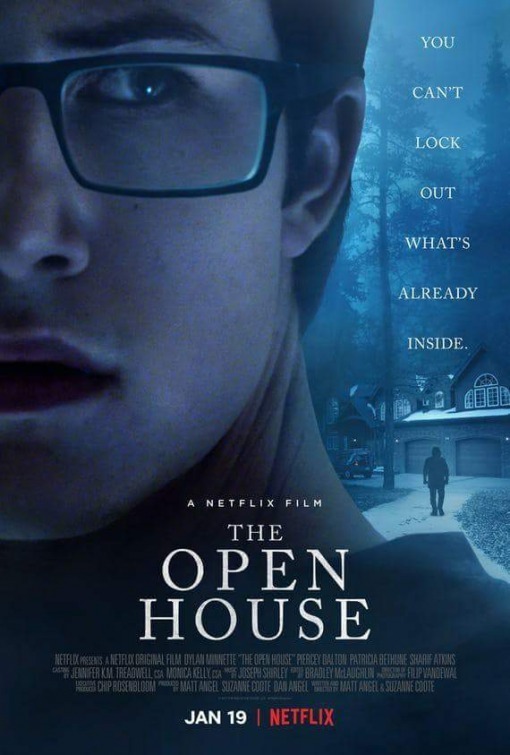 Synopsis: (from imdb) A teenager (Dylan Minnette) and his mother (Piercey Dalton) find themselves besieged by threatening forces when they move into a new house. If you’re a fan of horror movies where “the black guy dies first”, this movie is for you. To begin, let me tell you I watch a LOT of garbage. As a person who watched horror movies, I have accepted and even embraced the fact that not every movie I screen will be good or even palatable. Still, even in the worst of horror movies so far, I’ve been able to not be disgusted by them. Sure, they’ve been dumb, silly and downright terrible, but there was always a little spark of originality or the fact the movie didn’t take itself too seriously which mitigated its terribleness. This is not the case with The Open House. If, after my dire warning, you still insist on watching this film in a serious way, read no more. I will be spoiling everything I can. All the spoilers. EVERY ONE! 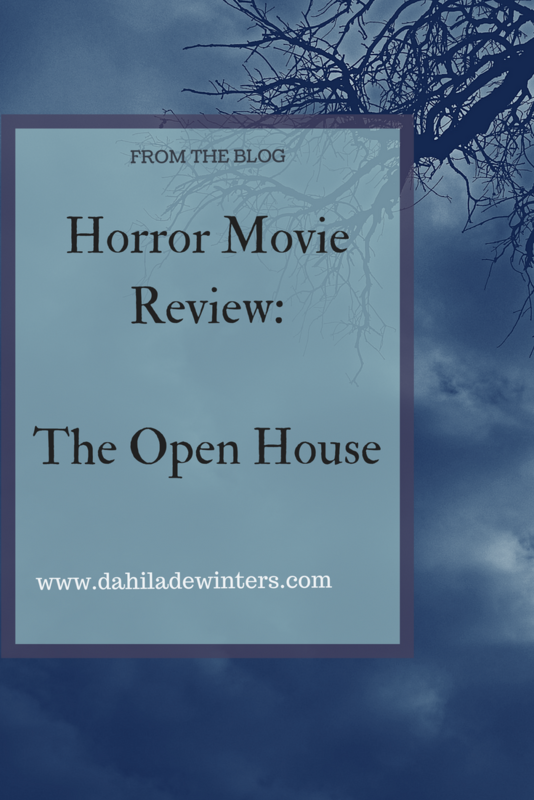 From both the poster and the movie trailer, the film promises a mysterious movie in which a weekly Open House may or may not be inviting in a killer. The film poster, done in bluish-gray “horror movie tones” showed a shadowy figure standing menacingly in a driveway. Both advertisement mediums indicated a good, scary time lorded over by this scary figure. When I logged on to Netflix to chill out and watch some reruns of The Office, it popped right up on my feed. So, I said, what the heck? Oh, foolish Dahlia. Foolish, foolish, Dahlia. Main character suffers a devastating tragedy. Main character has to relocate because of…whatever issues. Turns out Dad was a deadbeat and didn’t leave any insurance. So Mom and son have to go to live in her sister’s house, which she just so happens to have up for sale. Which brings us to the next cliche. New location is located in a remote place with spotty cell service. :::::Mouth open:::::: Heffa, did you hear a thump? I’m sorry, but I’ve got to really ding the movie for this. I can’t with this one. There was no thump….why the heck did you think you hit him? I began to think this movie wasn’t going to have any legs. But it did have cliches! Check out the next one. Explore a creepy basement/attic with a flashlight. They get to the house. Bring in their stuff. Then the mother disappears somewhere and the boy is in the kitchen by himself. Oh, look there’s a door! It leads to a basement, WHICH HAS NO LIGHT SWITCH. No worries, just pick up this handy flashlight and go right on down! Also, what was up with the maze in the basement? Stone walls? Is this Wolfenstein? No rhyme or reason, just wander around down there until your mother calls for you. The weird thing was, they never discuss how weird the basement was, not even a throw off line. I tell you what, if I lived in a house like that with a creepy basement, I sure would be on the lookout for, well, creepiness. The characters go into a store or something and an older woman comes up to them. “You must be Logan….and you are Naomi”. Ooooo, spooky. They are on alert. How does this woman know their names. “Oh, your sister emailed me with your pictures.” Okay, why didn’t the sister TELL THEM that? Cheap scary moment. Random crazy woman not so crazy…or is she? You’re back and forth with that, movie. And I despise you for it. Oh, the tangled web we weave when we try to scare. Sigh. The silly jump scares abound. Unfortunately, no cat scares…that at least would have been mildly entertaining. Saying “hello” when there’s a weird sound/event. There’s a scene where Logan, the teenager, is awakened by a honking horn. He gets up, goes to the window and peeks out. There is a car sitting in their driveway, with its lights on bright so he really can’t see anything. He stands there for a while until the car honks its horn. Logan then GOES OUTSIDE (no coat, no shoes) and tries to see who is in the car. What the heck? Then, he goes back to bed and DOES NOT TELL HIS MOTHER. Whaaaa? I dig that they’re kind of estranged because of the father’s death and their poorness, but…..c’mon man! You live in a house, an apartment whatever. You know when doors are open and closed, right? Well, these two don’t. The mother goes somewhere in the house, walks past a door. As we watch, the door opens. When she comes back, and walks right past the door, she doesn’t close it, nor does she even seem to register that it’s open in the first place. I just shook my head. By that time in the movie, I was just watching to see what happened. Kid has a cereal bowl in his room. He goes to do something, and finds his cereal bowl in the living room. Says nothing. So something scary happens, furniture is rearranged when they leave the house. They come back, are shocked, and FINALLY call the police. After trying to keep his mother from even talking to this dude earlier in the movie, Kid invites the only other black guy in the movie besides the cop, Chris, over to, I guess, protect them against the creepy stuff. And also to be the first victim of mysterious killer. Yeah. Bite it, movie, with your oldest cliche in the damn horror movie book. Note: There are two black men in this movie. One is a red herring and dies first, the other is a police officer and has THREE WORDS to say. This is 2018, right? I thought we were done with the stereotypes and cliches, but I guess not. Bugger off, movie. As if you didn’t know this already, this movie is not recommended, even for fun. It’s a dud of a movie, and I truly felt I wasted my time watching it. If you want to see the trailer, I’m sure it’s on YouTube. I’ve wasted enough of my life on this movie as it is. Grade: F-. You are not approved for a mortgage. Note: There are a few times where I think I say I’m sorry? Well, I’m NOT!! I think I’m the kind of person who’s just over “regular” TV. I’m sick of these fake reality shows. Sorry, but no one’s life is that interesting for me to watch week after week after week. And anyone who actually thinks these reality shows are real…well, I don’t have much to say to that either. That being said, I’ve rediscovered the joy of an actual story which doesn’t include someone getting told off or embarrassed to bring high ratings. The good shows are not only on Netflix and Hulu, but some of the premium channels manage to bring some quality programming also. 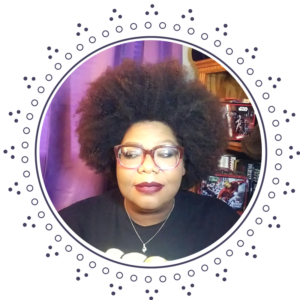 Today I’m chatting about Stranger Things on Netflix. When I read about this series in a friend’s status on Facebook, I rushed to my Roku to watch it. What a show! Even the title font evokes the feeling of those old Stephen King paperbacks and old push button wall telephones. I’m only two episodes in, but I’m hooked. Why only two episodes when the entire season is ready to go? I tried to binge watch. It doesn’t work. There is so much to absorb and think about with these well written shows. I just can’t watch one after the other after the other. Thinking about a story after it is over is the afterglow of seeing a good show. I see each episode as an experience. When you rush from one experience to the other, one doesn’t fully absorb all the nuances of each. So, I’m two episodes in and I’m pretty pleased. If you’re a fan of the 80s and Super-8, then this show is for you. When my son walked in while I was watching it, he told me it looked like The Goonies. Take a watch, if you’re a mind to. Here’s the trailer. I’ve seen all over social media about how people are planning to order in and binge watch this show or that show on Netflix (my viewing poison of choice) or from their bulging DVR lists. Take it from me, I love some television. I will watch Mountain Monsters, Law and Order (The Lenny Briscoe years), Finding Bigfoot (you know they’re just thisclose to finding Bigfoot, right?) River Monsters and an occasional Tosh.0. But I don’t binge watch. It drives me nuts. Being a detailed oriented person, I tend to notice details and the underlying structure of things. Take Law and Order for instance. The show follows a consistent pattern most times you see it. It’s comforting, knowing what’s coming next, but yet still being entertained by the writing. Most shows, however don’t stand up to that scrutiny. One show I watched on Netflix was so fascinating to me I kept clicking “next episode”. After the third episode, however, I found myself getting annoyed with the characters. By the fourth, I was rolling my eyes and shut it off in the middle. The problem was, each and every episode started with one character wandering off and the second character chasing after him. This is how they jumped into whatever hijinks the writers scheduled for them that week. Yawn. Wasn’t there any other way to kick off the inciting incident? Binge-watching keeps me from absorbing the nuances of an episode, rolling the events of the story around in my head and mulling over what might happen next. Watching one episode after another doesn’t give me space or time to do that. I like to let the characters and situations linger, allow them to breathe like a fine wine. I certainly wouldn’t pour a bottle of perfume over myself. Binge watching is like eating a whole cake in one sitting. Sure, the first two or three pieces might be pretty good, but after that, the flavor becomes dull and unsatisfying. So I don’t binge watch. I don’t like it and sometimes it serves to turn me off a show. Plus who has the time to veg out in front of the television? There’s life outside to be lived!